When one is part of an overwhelming experience, it is hard to know or where to start or to sum it up in a few words or stories. I now understand a bit how my son Owen must have felt when he returned from a semester studying abroad in Patagonia. As I hugged him at the O’Hare baggage claim, I wanted him to start sharing everything about his adventures, but instead, there was initially not much spoken. It was enough just to ‘be’ for him. We eagerly awaited stories that unfolded the following days and weeks as the hundreds of photos helped him share his journey and its’ impact on his life. 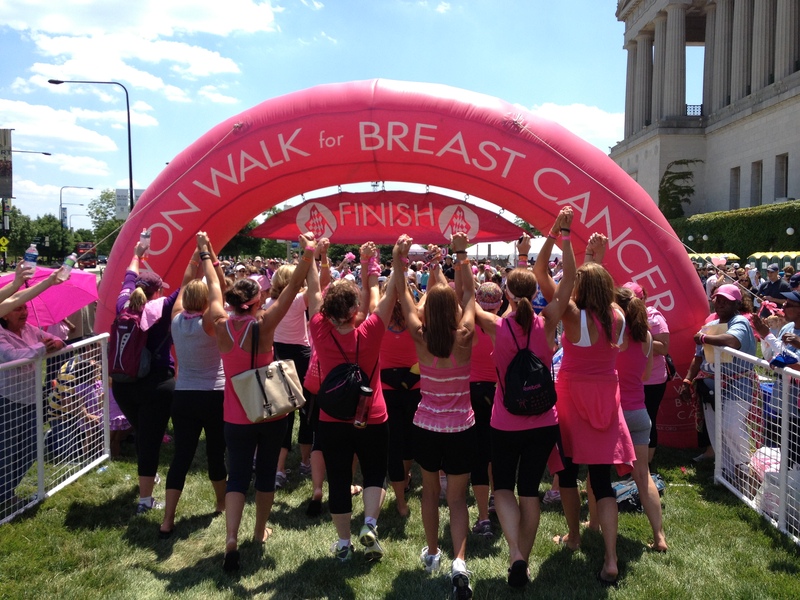 So, when I crossed the finish line at last weekend’s Avon 2-Day Breast Cancer walk, the completion was bitter sweet. My mind raced…the exhilaration of completing a lofty goal, the physical fatigue of finishing 39.3 miles of walking in two days, the emotional exhaustion of the experience with 3,000 other walkers and the joy of seeing my family there to support me as I walked the last steps through the pink arch. The finish line was a bit backed up, so people had to wait their turn. The group that finished the walk just before me must have pre-planned an arm-locking routine to cross the finish line together. I took the photo because it captured how I felt. Their image is emblazoned in my memory. The fact that this group is nameless and we can’t see their faces is particularly moving for me. It illustrates our society’s ongoing fight with breast cancer. We need to work together to find better prevention strategies, drugs, radiation techniques, therapies and support systems. Nobody should be left to navigate or endure cancer alone. At the final rest stop, I did a superman ‘costume change’ in the cramped and well-used port-o-let. I purposefully pulled on my cotton Avon walk T-shirt that had been signed by my sponsors. I had started the walk with the shirt on so wanted to finish full circle. The signatures were my ‘team’ that walked with me spiritually. Their support (or the buzz of their texts of encouragement) fueled me in a way that rest stops could not. When I thought about quitting at mile 12 the first day after a slight calf pull (or riding in a sweep vehicle), the ‘team’ cheered me on. When I felt pain, I imagined what cancer patients go through every day and my temporary plight seemed to lessen. Yes, my body was only a team of one, but every signature on the shirt walked alongside me and crossed the finish line with me. So, as I am still decompressing from the event and what it meant to me, I’ll mull over what to write about it for future blogs. There are enough ideas and content to keep me busy for quite some time. The journey continues and there are new goals to be set. But for now, I’ll enjoy some time on the front porch catching up with all the loose ends in my life and basking in the glow of being part of a movement profoundly bigger than I.